If School Kids Get It – Why Can’t Adults? Every so often I get an insight into what is wrong with our approach to health. Hardly a day goes by without some expert lamenting the rise in obesity levels and calling for government action usually in the guise of “funding “ for one of their pet projects. The biggest problem with the whole obesity “crisis” is that people look everywhere for the answer except where it actually lies. See if you can spot what is wrong with this quote from international obesity expert Dr Ian Campbell who was quoted in Medical Observer; “There is that prevailing misconception that obesity is the individuals fault”. He then want on to call for assorted forms of legislation like banning “junk food’ advertising. The term fault is not one that I am fond of as it is pejorative. However to suggest that it is a misconception that the individual is responsible for what they put into their mouth shows how far removed from reality we have become. No amount of legislation will affect what the individual chooses to eat. The only person who can influence this and indeed change this is the individual. There are two problems with this refusal to tell it like it is . One is that much money is wasted on a whole raft of measures, which do not actually deal with the problem. Second and worse is that by telling people that it is not their responsibility, the only people who can actually do something are told not to bother. There is no need for you to drink water instead of soda because banning advertising will fix that. There is no need to choose an apple instead of a donut, as we will have a government program to write leaflets about that. It was particularly noticeable for me that on the same day as I read the quote from Dr Campbell I attended the assembly at my sons school. One of the year 12 boys gave a speech to the whole school. He said that he would speak of three things; the past, the present and the future. Essentially he told the school that the past was gone and could provide lessons and that what was done in the present would determine what the future would hold. Most importantly he told the school that what happens to you may be influenced to some extent by external forces but is basically a function of your actions. How fascinating then that a high school student understands that what happens to us is a consequence of the decisions and choices we make (for example he said that if your goal was to study at university then one of your tasks would be to study so that you get sufficient grades to do so). Contrast this with our friend Dr Campbell who tells people that if they are overweight it has nothing to do with the actions they take. If high school students can grasp that their actions and choices are their own responsibility and that if they want a different result they will need to do things differently then as adults we have absolutely no excuse and no right to blame others for our own choices and actions. For those who want to lose weight there are two really simple things you can do that will help. One is to eat more slowly and the other is to have a glass of water before meals. How simple is that? This is real action that can be taken today. It is a simple matter of being responsible for what you do. I really do find it inconceivable that obesity expert Dr Campbell feels it is not the individual’s fault if he or she is obese. All this talk of reducing advertising of junk foods etc will have those who don’t eat nod their heads wisely but those that eat junk foods will go on eating it regardless. I think the idea of a glass of water before meals is a good idea but as for eating slowly I am not sure. I have through my 82 years always been told I am the slowest eater in the family but it has never kept me slim. I do think genetics do have something to do with whether people will remain slim or become fat/obese and in my case lack of exercise through chronic arthritis doesn’t help. I am also diabetic and we constantly are told ‘eat more carbs’. It is a difficult world in which we live from many aspects and not all dieticians agree so we are left to try and sort it out for ourselves. I eat 3 sensible meals a day with the occasional treat but even I obviously eat too much. My daughter (at 58) had to turn to stomach stapling to bring her diabetes under control. It has worked well but she has to live with results for the rest of her life so it was a very drastic step to take. She was a lover of food and quite often the wrong type and had to learn the hard way. 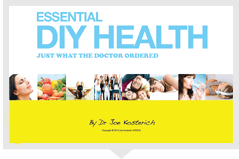 Dr Joe I read all your posts and learn so much from them and agree with you nearly 100% of the time. Thank you for so much intelligent, down to earth information. Rather than nature or nurture it really is nature AND nurture. Your idea about the glass of water is excellent as is eating more slowly.